This is how much you could get for your old phone(s). Click the button below to see how much you can get for it. Search for your phone to see how much you could get for it. Please note that the price quoted is indicative and can vary when you place your trade-in, based on the condition you select for your device. Full terms and conditions can be found here. "Samsung’s Galaxy Note 8 is overflowing with amazing features, including a huge 6.3-inch Quad HD screen, iris scanner, new and improved S Pen, and dual lens 12MP camera." The latest and greatest Galaxy has arrived. 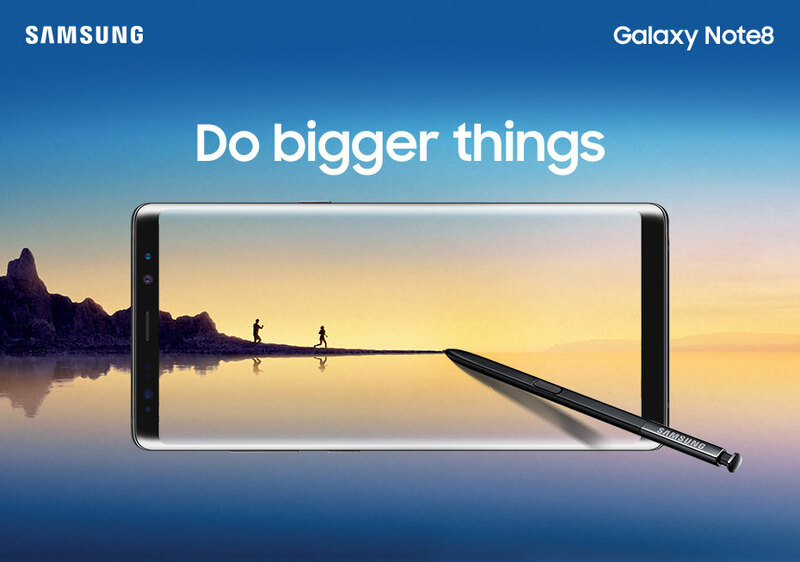 With an expanded boundary-breaking Infinity Display, a seamless note-taking experience and the chance to go even bigger with desktop viewing, the Galaxy Note8 is making big waves. With a thinner tip and greater pressure sensitivity the improved S Pen is all about speed and precision. So get creative and capture those moments of genius whenever and wherever the strike. You can even use the S Pen in Live Message to customise your own emojis. Our first ever dual rear 12mp camera is even better for low-light, close zoom and wide-angle shots. And its 2X optical zoom and Optical Image Stabilisation lets you capture stunning images from afar or with a bokeh effect. Shooting breathtaking scenes or snapping unforgettable moments - it's unbeatable. Our stunning Infinity Display is back - and this time it's even bigger. Measuring 6.3", the expanded screen edge opens up limitless possibilities. So you can enjoy more of the things you love. A cinematic experience on the go, perhaps? 10nm mobile AP, 6.8G of RAM and 64GB internal memory gives you even more storage for all your must-have content. And it's all easy to access in one place. If you need more space, there's expandable memory for a microSD* card up to 512GB. No more memorising long usernames and passwords. The Galaxy Note8 comes with an innovative iris scanner that lets you, and only you, open it with your eyes. So you'll have peace of mind that your personal information is even more secure. Updating your status in the rain or Instagramming at the beach - whatever life throws at you, with IP68 certified dust and water resistance, the Galaxy Note8 can handle it all. With Bixby, you've literally got a concierge on-hand. Going way beyond chatting, Bixby's mission is to make your life easier - shopping, translating, working your apps for you - all you need to do is ask. Switching to a new phone is a big step, but with Smart Switch it's a breeze. The app moves all your important contacts, messages, photos and settings from your old phone to your new Galaxy Note8, so you can pick up where you left off. Connect the Galaxy Note8 to the Gear VR and see how the intuitive new controller gives you ultimate control of your virtual adventures. Pair the Galaxy Note8 with the Gear 360 to share your life like never before with social live 360 streaming, and relive moments with flawless 4K 360 video recording. What is the f-stop on the rear wide-angle and telephoto camera? What is the pressure sensitivity on the S Pen? 4096 levels of pressure sensitivity. Which brand of headphones does the Samsung Galaxy Note 8 come with? With every Samsung Galaxy Note 8 , you’ll receive a pair of earbuds tuned by AKG in the box as standard. What type of SIM card is compatible with the Samsung Note 8? Which VR headset can I use with the Samsung Note 8? The Samsung Galaxy Note 8 is great for VR. You can use the new Samsung Gear VR headset with it, which comes with handheld controller for an even more immersive experience. If you’re looking for quick, convenient charging for your Samsung smartphone, then look no further than the Samsung Fast Wireless Charger. It boosts your phone power fast and with its curved design and ambient LED lighting, it looks great too. Samsung Galaxy Note8 is rated 4.7 out of 5 by 20. Rated 4 out of 5 by MAM1274 from The great media combine After Galaxy S7 Galaxy Note 8 feels a little bit bulky as a media combine the telephone is great. I experienced the following problems: - Unreliable work with the memory card regularly loses an access to it; - Voluntary disconnection from a network at standby mod; - Spontaneous switching to the loudspeaker during a call; - The protective glass is more prone to damage than at the Galaxy S7. Rated 5 out of 5 by Ekaligreece from Phone and Mini Computer plus Great Camera I have had the Samsung Note 8 for some 10 months now and am absolutely delighted with this phone. It is with me all waking hours providing me with my emails on the move, access to TV and weather info, plus instant Google access. The twin lens camera (plus forward facing lens) is excellent and takes high quality photographs with the rear lenses. I used to lug a large camera bag around but not now as the Note 8 takes good photos even in low light although moving objects may be blurry in low light. Oh, it also handles phone calls and texts!! The battery life holds up reasonably but if being used extensively for video and the like top up charging may be needed. I have the Samsung wireless Inductive rapid charge stand which is excellent. My "normal" daily use for emails, texts and calls uses about 60% battery life without top-up charging. I did purchase the Samsung bespoke case which pairs with the phone to turn it on when you open it. Having dropped the phone several times the case has done an excellent protection job. This Note 8 is my constant companion. Rated 5 out of 5 by Ned W from Take note of the Note.. 5 stars!! Got this last week at an absolute steal price of £649..Purchased SIM free as I couldn't resist the price and sold my S8 privately for £400 smackeroos. chuffed to bits with my new device, screen, s pen, camera, battery and a whopping 6gb ram & water resistant. Its literally like having a mini laptop in your pocket. True powerhouse, amazing specs that will hands down compete with the current market for years to come. Rated 5 out of 5 by Howie aka Anonymous from The best most advanced device to date. PERIOD I pre-ordered this device and wow... I didn't think anything could match up to my S8+ but the note 8 blew it out of the sky with the fantastic s-pen and dual optical stabilized cameras not to mention the extra RAM. Everything works fluidly smooth and copes with any task I've given it. The note8 makes my S8+ feel like a kiddies toy now I'm used to it. Nothing available on the market comes close The build quality is second to none and feels as a premium device should and I have tried them all but this is far superior than any other!!! Get this device, you wont be disappointed. I cant say enough praises about the note8..